Ok. So This should be ok now. What about the I²C Pins? 3 & 5 on RPI? They just connect straight 3 - 3 and 5 - 5 right? As I said just check with the Pins of the IC to be on the safe side. Glaube wir könnten in deutsch weitermachen...but to keep it multilingual we will go on in english.. Here is what I finally think must work. Compared to the IC1 connection this must be final!!! Great work! I will PM you. I've soldered my first Rockaberryboard with the parts I got from Benjamin (thank you!). So far I couldn't get any audio out of it. However, I suspect this is a software configuration issue. I use OSMC on an RPI B+. I ran an update of the system software. I followed the instruction for the installation of a "Hifiberry" board. I have selected the "Hifiberry Digi" in the Pi Config menu. However, in the list of available audio outputs, I only get the ALSA Default (bcm2835), which I think is wrong (see screenshot). This setting will output the audio via the HDMI, not the optical output. Does anyone have a suggestion how to fix this? How do I make the "Hifiberry digi" appear in the list of Audio output devices? Thank you very much! But he also had some other bugs in OSMC with Full HD Videos so he switched also to OpenElec now. But basically it works with OSMC. Or you also try OpenElec (you can make anyway a backup of your SD card and set it back if you don't like it). Finally hooked the Rockaberryboard to a different RPi which had the Hifiberry Digi option pre-installed. Works like a charm! I would like to add a SPDIF output to my Raspberry Pi 2 (and perhaps Pi 3) so I've found this thread. Is it possible to buy and delivery to France ? yes I still have parts left. TinyTOSLINK on Pi 3 Model B? did anyone try such a TinyTOSLINK module on the Pi3 already? There should be no difference regarding drivers or pinout, correct? I guess that it might be more important to go for a "low profile" transmitter module as the WLAN antenna leaves less room than the LEDs on the older boards. 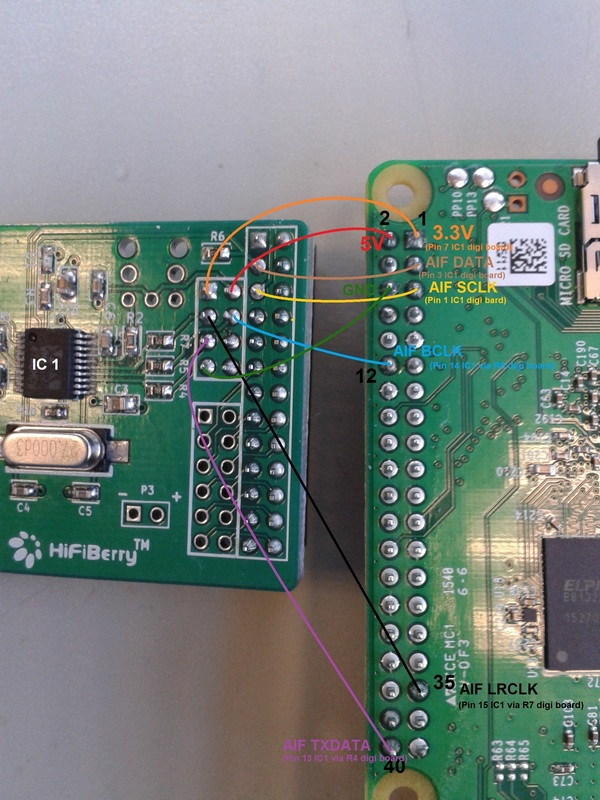 I have one of the recent boards made by Benjamin for the Raspberry Pi2. In terms of GPIO pinout, they should be compatible with the RPI3. However, I share your concerns about the PLT133 optical transmitter. It is quite tall and fills the entire space between the board and the status LEDs on the RPI2. For the RPI3, I would suggest to go for a different part to avoid a collision with the Wifi / Bluetooth antenna, which is presumably bulkier than the LEDs. Jörg, the original author of this threat, recommended a DLT2153A from Aixin. I'm also wondering wether it is possible to get one of the "mini Toslink" jacks like the ones used on Apple computers? Great job everybody for putting all this effort into tinyTOSLINK. I'm very interested in buying one of these. I use Raspberry Pi 2 with OSMC and my Samsung TV wont pass AC3/DTS through optical to my receiver Please let me know if it's still possible to get one, I understand that all you need (hardware wise) to do is to plug it into the Raspberry GPIO pins. I live in Germany if that is of any importance. Yes I still have some left. if you still have parts left and they are working fine with raspberry 2 then I am also interested. I don't get the tinytoslink working with my Raspi 3. I'm using OpenElec. Thank you so much, Jörg for the impressive work! I couldn't try it yet. But the Hardware is the same - so from HW point of view it should work. I now have a Pi3, just did my first Raspian tests with it. Nice board, it boots fast as hell, 15 seconds from power to prompt (incl. WiFi), compared to 34 seconds with my prevoius Pi2, or even 57 secs with the single core Pi B. A little drawback: The SD card slot has no spring locking any more, will make it difficult to get the card out when the board is in a case. TinyTOSLINK works as expected. Like previously, a fresh Debian "Jessie" needs the device tree overlay for Hifiberry Digi, then you're ready to go. [IDC]Dragon wrote: Nice board, it boots fast as hell, 15 seconds from power to prompt (incl. WiFi), compared to 34 seconds with my prevoius Pi2, or even 57 secs with the single core Pi B.
Oops, my testing wasn't fair, I didn't use the same SD card, each board had its own card and Raspian image. Pi2 boots in 13 seconds (even faster than Pi3! ), Pi B in 23 seconds. Edit: The new Raspian makes the difference! SD card has less effect, a no name class 10 is only slightly slower, however a class 4 card really takes longer. I also think this is a great project that perfectly fills the gap of Raspbery Pi digital audio support. I'm about to order RPI 2 b but I need to be sure it can support digital audio output because I want to use it as media center and connect it to my AMP's digital input. So first question is - do You still make TinyTOSLINK for B+ (and newer) RaspPI and is it possible that You can send me one? If yes then second question is can I use RCA connector insted of TOSLINK? My AMP has TOSLINK and RCA inputs and I wanted to use optical interface for signal from TV (which has only TOSLINK output) and use RCA for Raspberry. I thought about mounting RCA socket in RaspPi casing (to get rigid connector) and connecting it to TinyTOSLINK with wires. In that case TOSLINK socket on Your PCB would not be needed. first of all: yes I still have parts left and yes it is possible to use it with RPi2 as mediaplayer. Do you want to use the digital output via RCA socket (so that you only need 1 socket for the signal)? Otherwise you would need 2 sockets (left/right) or 6 sockets for 5.1? 5.1 with RCA sockets is not possible with the Pi in combination with Toslink - you would need something different here. But if you want to use stereo with RCA you just need a cable from the headphone output. If you want digital output via 1 RCA socket this is possible with my tinyToslink board - there is a connector where you can solder a cable to it. Thanks for quick reply! I need single RCA digital output to send stereo signal to my AMP. The best solution would be to have both RCA and TOSLINK connectors in case I needed to switch to TOSLINK. Is it possible with TinyTOSLINK to send signal to both optical and electrical outputs? I would use only one obviously but this solution would be future proof If not then RCA socket is sufficient for my current needs. If You are willing to send me TinyTOSLINK board please write me a PM to discuss details.